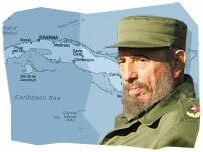 Fidel Castro has been the undisputed leader of the Cuban revolution since it triumphed in 1959. But 'el comandante' is now close to 80, and there is increasing debate on the island and in the United States -where some two million Cuban-Americans live- as to what will happen when he is no longer in charge. To his supporters, Fidel Castro is the Cuban Revolution. They see him as the inspiration behind all its achievements, from free education and health services to the island¿s success at baseball. But they are increasingly worried who can fill his shoes when what some of them term his 'state of biological change' takes place. Will his younger brother Raul, the head of Cuba's armed forces, take over as planned? Can any of the generation who ushered in the revolution in the 1960s fill his shoes? Or is now the time for the young generation of his supporters to finally make their presence felt? Those who are critical of Fidel Castro's 47-year rule are also making plans. They see his disappearance as the chance for regime change on the island - with all the dangers and opportunities that represents.